Take in that view from the summit! Notice the Sherwood Chair loading area and parking space on the lower left of the picture. The more adventurous that tour on the ridge past Grouse Peak on to the Little Alaska zone will find an endless bounty of exciting terrain with perfect cliffs and steep spines. Just make sure you have enough energy to get to the car, and a map to show you the way. The more time you spend in this zone the more open glades of powder you can learn to link right back to the car for some excellent skiing. 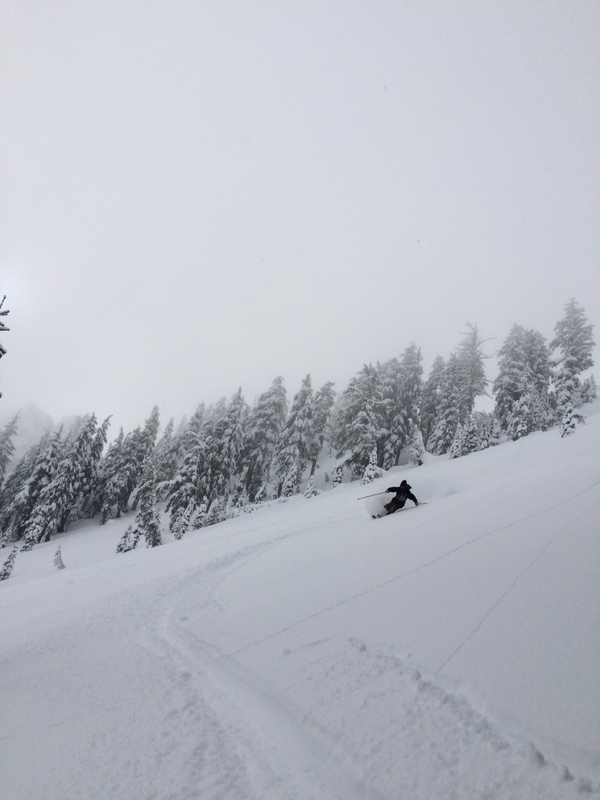 Wide open glades for slashing up that deep powder! Don’t forget to look back over your shoulder on the hike up, great Lake Tahoe views on this west shore tour. Another shot from the top of Grouse Peak, the rocky buttress poking up in the background. Powder loaded pines on the approach to Grouse Peak. The rocky summit is visible peaking out from the trees ahead. The climb is about 1.5-2.0 miles one-way to the ridgeline, the specific route is always a little different with the skin track. 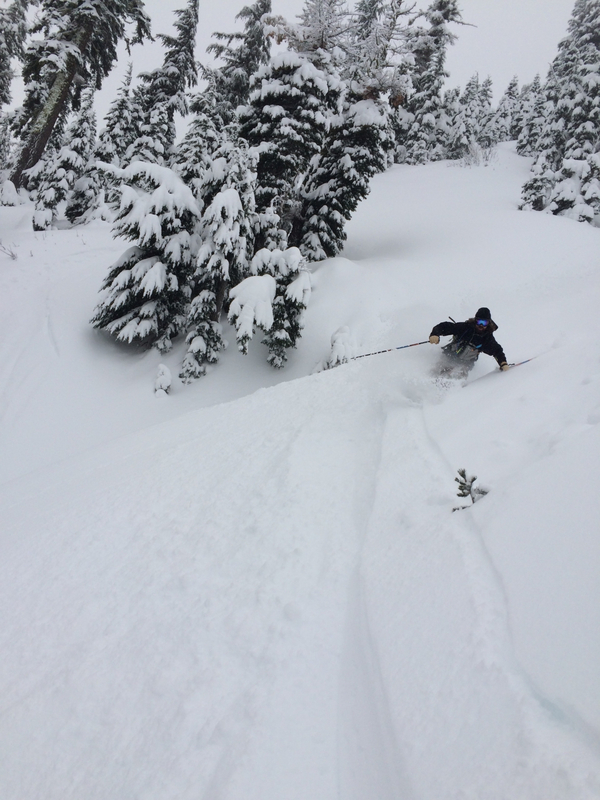 This is an intermediate backcountry ski or split board tour. Basic route finding skills are a must to ensure you get right back to the car as the area can get a little confusing on the descent. No dogs are allowed on the ski area while the lift is running, but if Sherwood Chair is not spinning dogs are generally ok here. This is an excellent backcountry ski tour for moderately experienced backcountry skiers and snowboarders. 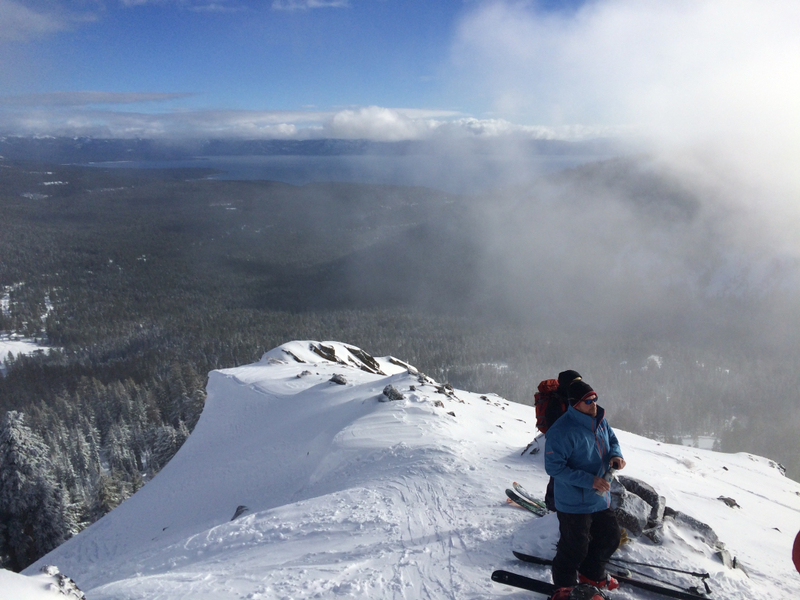 This classic Lake Tahoe ski begins from the quaint woody pines of the West shore and climbs up to the Sierra Crest with sweeping views of Lake Tahoe and some great glade skiing back to the car. Grouse Peak is an obvious destination appearing as a large square rock outcropping on the ridgeline looking up to the west from the parking area at the top or end of Ward Creek. Grouse Peak sits atop the Sierra Crest along the Pacific Crest Trail, it’s west flank sweeps down to the Granit Chief Wilderness Area while it’s east and northeast slopes rise up from the Lake Tahoe Basin and the Tahoe National Forest. Grouse Peak offers both northeast aspect powder stashes and glades or if you can time your morning climb just right you can find some perfect spring corn dropping off the southeast aspect of the summit and approach ridge and ski the smooth dreamy Mister Ed’s spring ski descent in the sun. This area is pretty magical with more and more glades to link on the descent the more you explore. Going further into the canyon you get to the Little Alaska area, then finally on to Twin Peaks. Endless options to explore rand amazing terrain abound. Just make sure to follow a map or watch the GPS on this one. Take care to end up in the same drainage as the Sherwood chair loading area that you ascended. 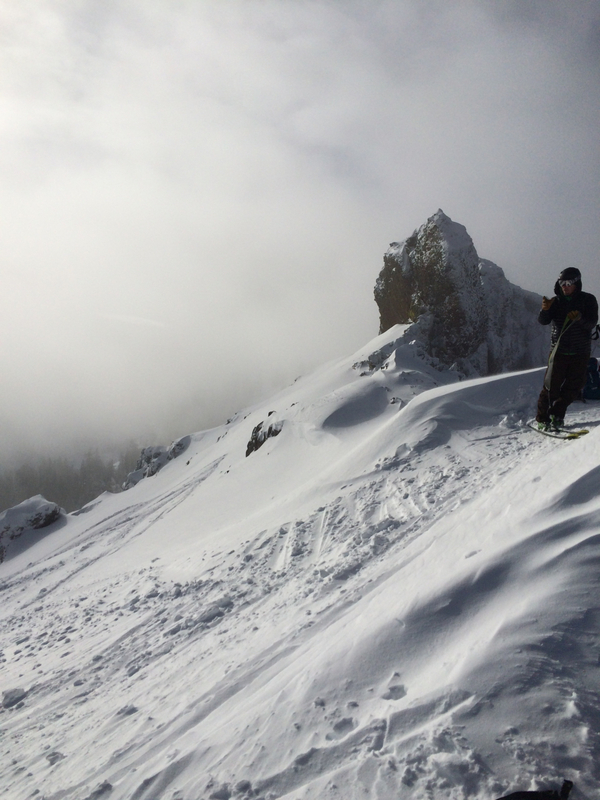 You wouldn’t be the first skier or snowboarder to miss the ridge on the descent and pass below the Sherwood chair and down into the canyon of Ward Creek; this can add hours and unnecessary uphill hiking to the end of the day. 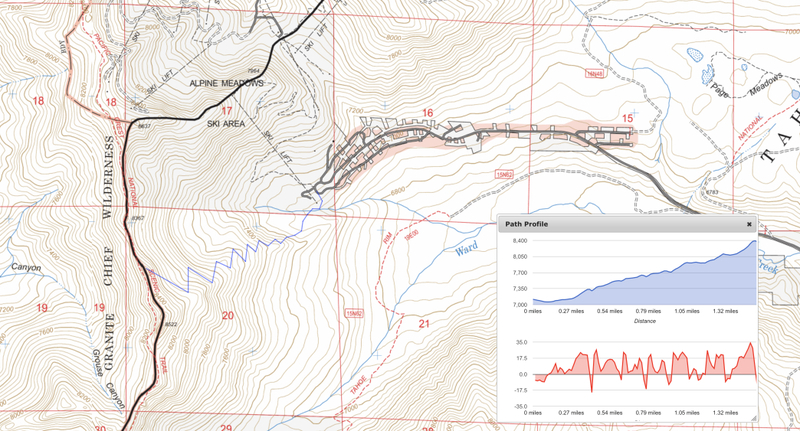 This is a relatively strenuous intermediate backcountry ski tour gaining ~1500 feet over ~1.5 miles. 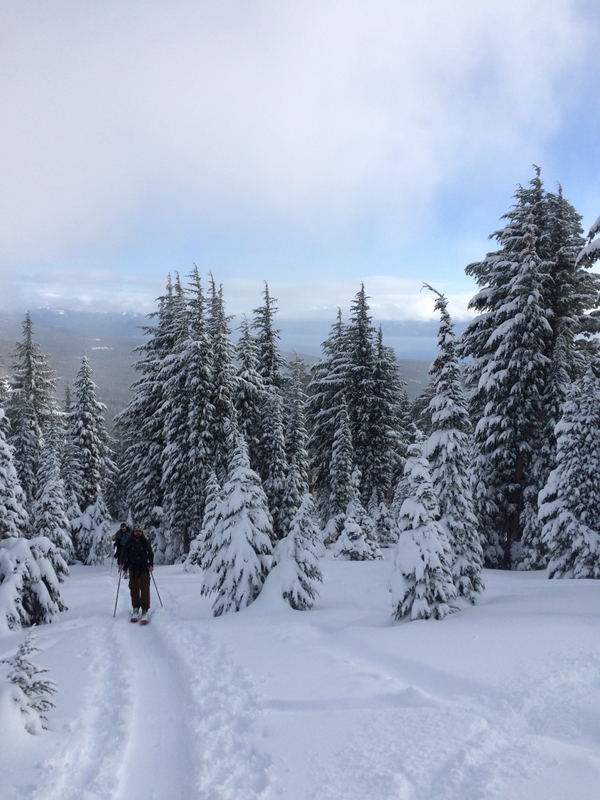 The beautiful glades and perfectly spaced trees make for great ski options for all abilities. 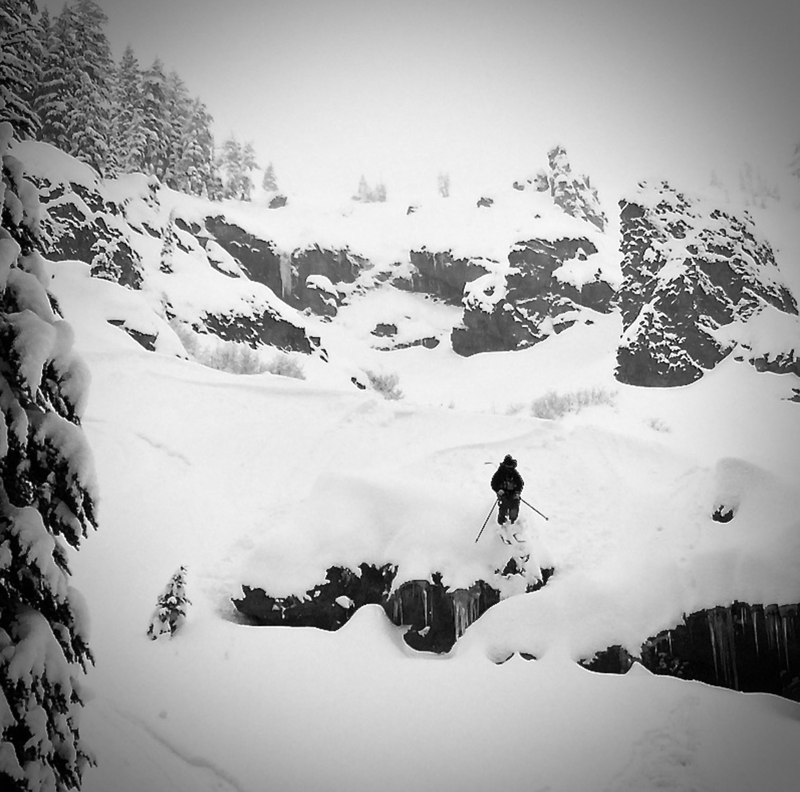 As always, knowledge of safe backcountry travel and route finding is a must for this tour. This tour is just beyond the borders of Alpine Meadows Ski Area and therefore no avalanche control is performed here. 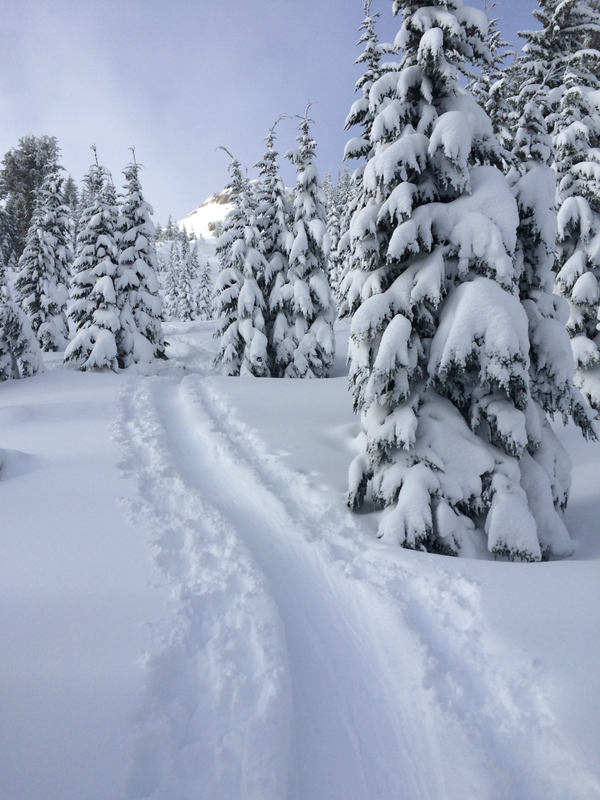 Exercise caution as always when traveling in avalanche terrain; make sure your group is equipped with avalanche shovels, beacons, probes and most importantly the knowledge to avoid avalanches and use your equipment. There is a small parking lot at the bottom of Alpine Meadow’s backside chairlift, Sherwood Chair. Drive south on CA-89 for 2.5 miles from Tahoe City. Turn right on Pineland Drive, follow Pineland for 0.4 miles then veer to the left as the road splits, onto Twin Peaks Drive which turns into Ward Creek Boulevard. Watch for brief but impressive views of Twin Peaks looking up to the left, following the canyon up for another 4 miles until the row of parking on the left side of the road and the bottom loading station for Sherwood Chair comes into view. This area can accommodate about 15 vehicles and was designed specifically for pass holding Ward Canyon homeowners and ticketing or towing here is a real possibility. It is best to use this parking area when the Sherwood Chair is not in operation, either early season or early in the day. As you leave the parking area, head slightly down sloping below the loading area of the Sherwood Chair trending towards the flat-topped Grouse Peak visible on the ridge. A skin track typically exists guiding the switchbacks up through the large pines, towards the Sierra Crest and your objective. Depending on the time of year and snow coverage the first challenge can be negotiating some of the small streams and creeks while moving up towards the ridge. Gain the main approach ridge coming down toward the parking area and grind out the climb up to Grouse Peak. The steepest section of climb is the last bit in the clearings approaching the ridgeline. If you still have energy continue on the ridge from here towards Little AK/Twin Peaks for a big day. Especially if you are venturing further into the canyon, remember to exercise caution on the descent and route finding to make it right back to that cold beer at the car.